I had some big plans for this past weekend. It was in the 70’s in Seattle and everyone was out on the lake, gardening, running, biking, and lounging on patios. Our house, on the other hand, came down with the plague. Sam’s been struggling with his allergies all week and I caught a rogue flu, so instead of beach picnics and planting herbs, I finally finished An Everlasting Meal, drank honeyed licorice tea, and took many naps. We did, also, drag ourselves to the U-District farmers market and picked up some rhubarb, sorrel, broccolini, and farm eggs. The fridge had become quite bare and it felt really good to have some color around. Now I’m not sure if we’ve chatted about this before, but I’m not the best sick person. I don’t do well just laying around, always feeling like I should at least be reading something engaging or watching an interesting movie or taking care of a writing project or two. So after waking up far too early on Sunday, my version of laying low was organizing our baking cupboard, getting our whole grain flours in order, putting on a pot of tea, and getting to work slicing rhubarb. While my to-do list was left alone, I did bake these Rhubarb Custard Crisp Bars, and I’ve been thankful to have them around. Little slices go well with tea. I’ve learned today they’re also quite nice for breakfast. 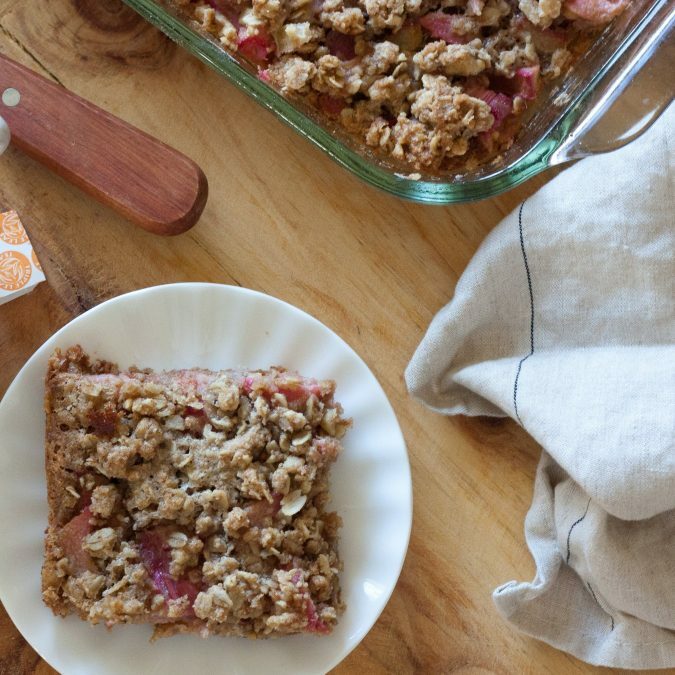 The tart rhubarb is balanced with just enough sugar (they’re not at all too sweet), the spelt crust brings out a buttery toastiness, and the nutty oat topping will remind you of every good fruit crisp you’ve eaten. They’ll remind you of late spring and gentle sunshine and of not being cooped up inside. If you’ve never worked with spelt flour before, it’s pretty wonderful. It’s a great entry way into whole-grain baking, so if you often experiment with whole wheat flour and are looking for something new, today’s your day. Kim Boyce, author of my very favorite baking book, Good to the Grain, describes spelt flour as having a “slightly tart aroma” yet being “distinctly sweet.” It substitutes 1:1 for all-purpose flour or whole-wheat flour for most recipes, so you can feel free to experiment away. For these bars, I used a recipe I’ve been looking forward to using from Chicken and Egg but made some significant changes, using whole-grain flour, taking down the sugar by half, and adding my crumble topping I like to use on pies and crisps. The result is a sturdier bite of rhubarb crisp, one you can actually hold in your hand and bring to the couch with you, if need be. Although they’d be just as happy, I think, outdoors on a picnic blanket. By all means, use all-purpose or whole-wheat flour here if that’s what you prefer or have on hand. And for the crumble topping, feel free to use pecans (or any other nut) instead of walnuts. The crust is simple to make, but if you’re more comfortable working with a food processor to blend in the butter and make your crust, that will work just fine, too. Next time I bake these, I’d love to experiment by layering in some fresh sliced strawberries and sprinkling candied ginger on top. For the Crust: Preheat the oven to 350 F. Butter a 11 x 7 inch glass baking pan. Stir together the spelt flour, brown sugar and salt in a small bowl until combined. Work the butter into the flour mixture with a pastry blender or your fingertips until the butter is evenly distributed and the size of small pebbles. The mixture should be dry and crumbly. Press the mixture firmly into the bottom of the pan to form the crust. Bake for 20 minutes or until the crust is turning a nice golden brown. For the Filling: While the crust bakes, whisk the sugar, flour, baking powder and salt together in a medium bowl. In a separate medium bowl, whisk together the eggs, egg yolk, vanilla, and ground ginger until smooth. Add the dry mixture into the egg mixture and whisk to combine. Add the rhubarb and stir until it’s completely coated. For the Topping: In a medium bowl, combine the spelt flour, oats, brown sugar, salt, ground ginger, and chopped walnuts. Stir to combine together. Add the melted butter and mix it into the dry ingredients (I use my hands at this point). The crisp topping should be quite clumpy. If it seems to wet or smooth, feel free to add a bit more flour or oats, 1 tablespoon at a time. Pour the rhubarb filling over the prepared crust. Sprinkle the crisp topping over the top. Bake for 30-35 minutes or until the top if golden brown. Cool for 30 minutes before slicing. Slice and serve slightly warm. 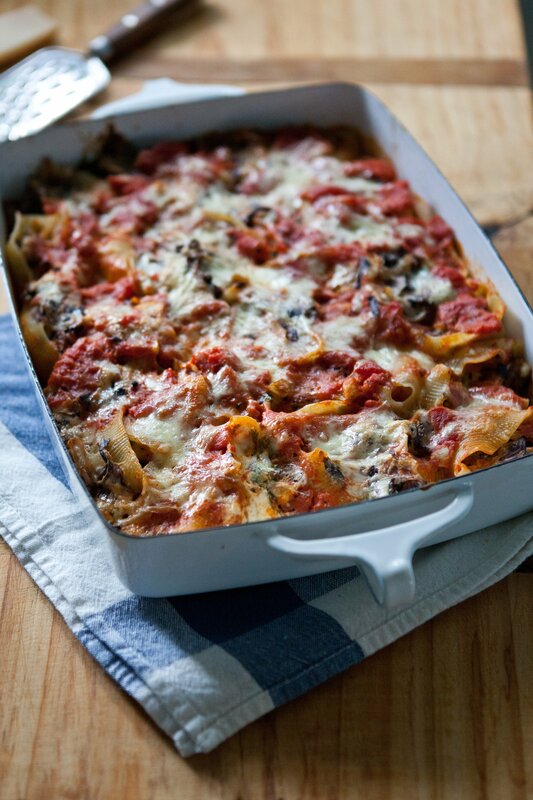 They are best on the day they’re made, but if you have leftovers, they keep beautifully covered and refrigerated for up to 2 days. Hope you two feel better soon! Being stuck in bed with tissues and tea while wasting a beautiful, breezy day makes me sad. I was meant to come across this recipe--on my way up the back steps just now I decided that my rhubarb is definitely ready to start picking. (The profusion of rhubarb is almost a consolation for never quite managing to grow enough tomatoes in my Seattle garden.) And yes to the candied ginger! Have you tried the rhubarb cake with the candied ginger topping from Rustic Fruit Desserts? If you like the combination you should check it out. i hope you are feeling better. it's no fun feeling under the weather when the WEATHER is so pretty out. i'm not good at being sick either. i try to be productive and then i get sicker. it's totally my plague. yum! i think i'm going to try this out with the rhubarb i have at home. thanks for the inspiration! I love rhubarb, not too sweet, and I want to try spelt flour. These look marvelous. I am a terrible sick person! Inevitably, I'll end up straightening up around the house, baking, or doing various chores. I call it my 'catchup' time. So funny. I hope you are feeling much better, and man, two cheers for rhubarb season! Good luck fighting that bug! I'm going on week 3! We're also on the Puget Sound. This one is a doozy! No, you were never a very good patient. 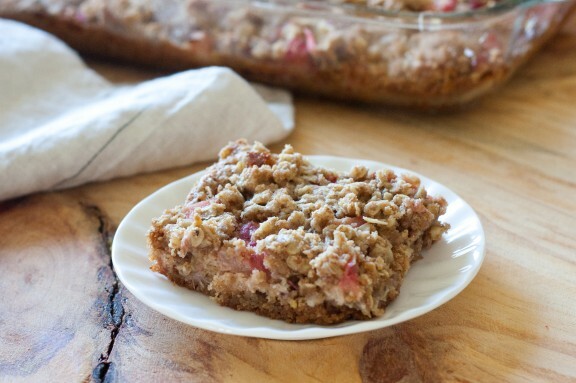 But when you were little I was just running up and down stairs- I didn't get these wonderful looking rhubarb bars! Miss You!!!! Lucky for us you aren't a good sick person. I'm thrilled to have learned a little bit about spelt flour. Feel better! Feel better soon! I have 8 flours thanks to Good to the Grain - and it's my fave baking book too. The bars look delicious. 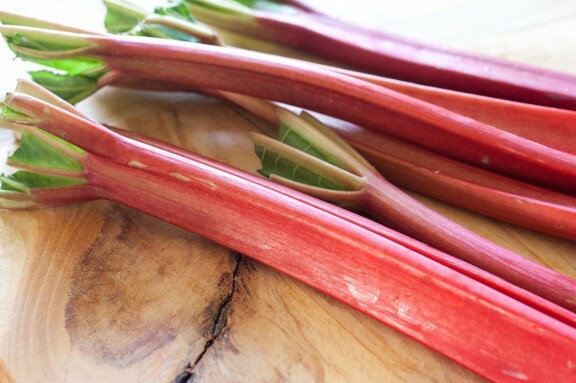 Now if only I could get my hands on some rhubarb...and some spelt flour - I try to use whole wheat flour when I can, but I'd love to try something new! Hope you feel better soon Megan! These bars looks absolutely gorgeous - I love the different textures and addition of nutty spelt. Rhubarb is one of my favourite things ever so will definitely be making these. I'll have to go out and get some to try these bars....and next time you're feeling bum lets have a chick flick day! I am a VERY good taker-care-of-sick-people....ask Mom! What a terrific rhubarb treat! 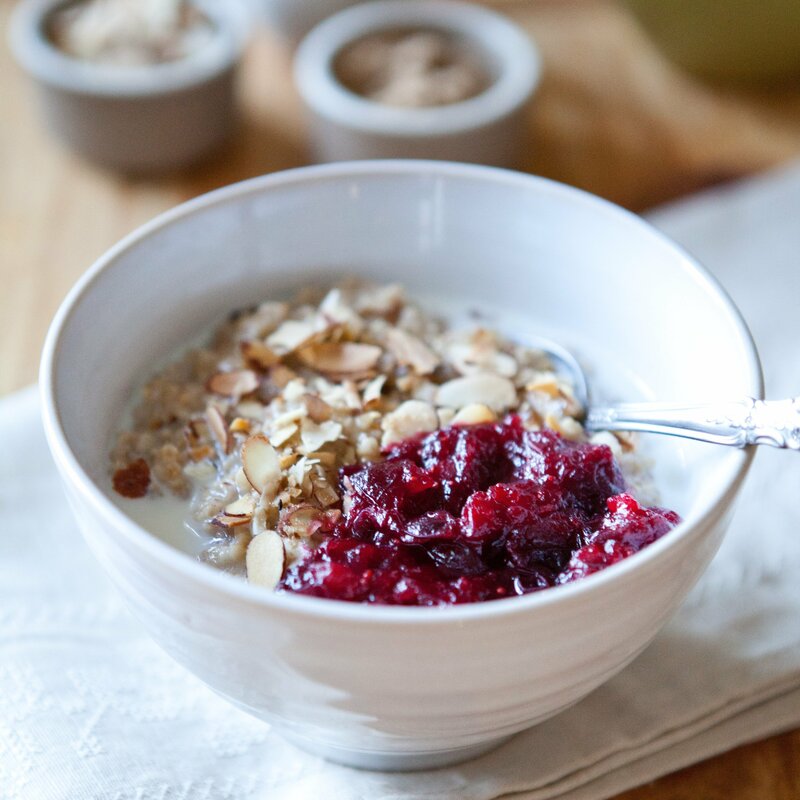 I love baking with whole grains, too, and am a Kim Boyce fan. I hope you're feeling better! Sorry you were sick on such a nice day. Looks like you made good use of the time. Hope you're doing better. The bars look delicious. I've never baked with spelt flour and this looks like a good introduction. I'm a horrible sick person - I think because I just can't nap. I've been craving some kind of fruit crumble since I moved into our new place, but I think these bars sound way better. Hello spring! Sick or slammed with work, sunny weekends without time/energy to play are such a downer. Glad to hear you're on the up and up - Happy Spring, pretty lady. Your sick day activities and my sick day activities sound very similar, though mine would include about 30 episodes of the old "What's My Line?" game show too. Thanks for the recipe. I hope you feel better soon.